Mukesh Sharma: Dead body of Kushal Chhetri(38) was found at the sole ground of Kalimpong town this morning. The body was found lying in a pool of blood which poured out from his head section from the staircase of Mela Ground.Some player and local who comes to ground to play and exercise saw the body and informed Kalimpong Police which reached the spot and first identified the body. Kushal Chhetri was working in a hotel at motar stand attached nearby to the spot . Police recovered the body and sent it for autopsy at Kalimpong Sub Divisional. Police has started its investigation after registering a case . Dead body of Kushal Chhetri(38) was found at the sole ground of Kalimpong town this morning. 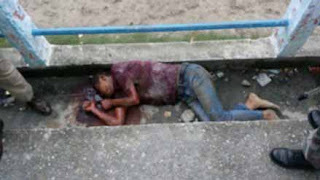 The body was found lying in a pool of blood which poured out from his head section from the staircase of Mela Ground.